If you're looking for true redundancy and the ability to build your own router with both BNC SDI and optical fiber SDI, then Universal Videohub is the perfect choice. Universal Videohub comes in two models for a maximum 72 x 72 or 288 x 288 crosspoint size, and because every module in the router is card based, you can mix and match components to get the router you need, and hot swap cards in the unlikely event of failure!Universal Videohub includes powerful features such as SD, HD and 3 Gb/s SDI auto-switching, built in deck control ports, and ethernet and serial crosspoint control. 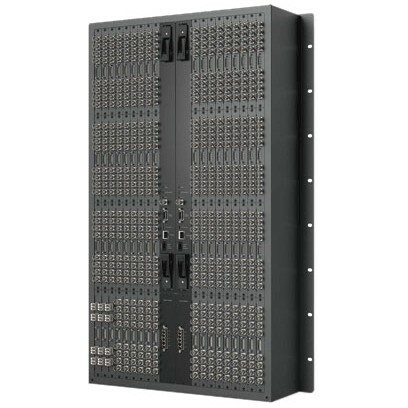 The larger Universal Videohub 288 model supports dual crosspoint and power supply cards for full redundancy. With Universal Videohub, you get flexibility, quality and redundancy, all at an incredibly affordable price. Universal Videohub ships unpopulated, without any cards plugged in, so you are free to build your router any way you want! For example, you can plug in BNC SDI cards and optical fiber SDI cards in any combination depending on the equipment you have. This makes it easy to partially load SDI interface cards, to start at an affordable size, and then add more SDI interface cards over time to grow to a massive 288 x 288 size! To make scalability even easier, the crosspoint card and power supply cards from the Universal Videohub 72 can be plugged into the Universal Videohub 288. Universal Videohub is the router you need for true 24/7 reliability because its card based design lets every electronic component be easily replaced in the rare event of failure. Universal Videohub has no electronic components on the motherboard and all electronics can be hot swapped with replacements in case of failure, or when upgrading. Universal Videohub 288 even includes an extra slot for a redundant crosspoint and power supply. In case of failure, the crosspoint will instantly change over allowing continuous operation. Universal Videohub 288 also offers true multiple fault redundancy, where different faults in both crosspoint cards can be handled. In the rare event of multiple faults occurring in both crosspoint cards, Universal Videohub 288 automatically detects and combines the still functioning parts of both crosspoint cards together to keep the router running. That's true multiple fault tolerance, unique to Universal Videohub, and eliminates any situation where a faulty crosspoint can go unnoticed and then be unavailable if the main crosspoint fails. With new 3 Gb/s SDI connections built in, Videohub allows twice the SDI data rate than normal HD-SDI. Use 3 Gb/s SDI for high resolution real time 2048 x 1556 feature film editing. 3 Gb/s SDI has full compatibility with SD, HD or 2K in 4:4:4 or 4:2:2 all with a single BNC cable. With 3 Gb/s SDI built in, you have full compatibility with all your current standard definition SDI and high definition SDI equipment, plus any future formats.